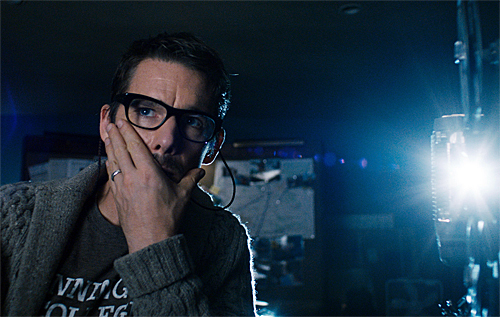 Desperate for inspiration to write another book, Ellison Oswalt (Ethan Hawke), a true-crime novelist, knowingly moved his family into a house whose past owners were murdered. Move-in day proved promising for the author when he found a box of Super 8 family movies in the attic which contained clips of five different families spending time with one another and eventually being killed in gruesome manners. Despite the images he witnessed, Ellison proceeded to research the crimes and write the book, all the while keeping his family unaware of their house’s history. Right from its first images in which not a word was uttered, “Sinister,” written by Scott Derrickson and C. Robert Cargill, commanded a darkness that captured and retained my attention until it dropped its intense promise with such an uninspired final act often expected from weaker haunted house movies. The build-up was quite impressive because there was an uncertainty as to whether the strange incidents could be attributed to human factor as opposed to something otherworldly. For example, the first big scare involving a box and what came out of it was deftly handled because it played upon a phenomenon that a lot of people had most likely heard of but not necessarily understand. That scene, which I suspected to be just another cheap attempt to get any reaction from us but turned out to be the complete opposite, reflected the filmmakers’ first-rate ability, if they wanted to, to create increasingly tense situations as the anxieties we felt in our guts swirled and swirled until a perfectly timed grotesque image, coupled with a loud noise, triggered our uneasiness to burst, sending jolts down our spines and limbs. However, its techniques in establishing dread was not its only weapon that drew us in. Hawke was convincing as a writer whose passion threatened to swallow him and his family whole. Ellison believed that he had another hit novel inside him just waiting to be written given the proper fire. Though he somehow convinced himself that the act of choosing to endure the house of horror was for his family, everyone knew except him that it was really about his ego. If it weren’t, he wouldn’t have stayed in that house, given what he learned about the crimes, and risked his family’s safety. The one argument between husband and wife (Juliet Rylance) may feel like it came from a marriage drama but, in this case, it felt right because it kept the story grounded. Meanwhile, the film’s more amusing segments involved Ellison and a local deputy (James Ransone) forming a sort of partnership, the latter expecting to have his name credited once the book was finished. We were given a chance to see very clearly the extent of how Ellison viewed himself so highly compared to a fan that behaved like a drooling dog, desperate for a pat on the head for each thing he got right. Unfortunately, the last act of “Sinister,” directed by Scott Derrickson, proved dull and uninspired, not at all worthy of the material that came before it. One of the worst feelings while watching a movie, despite the genre, is when we begin to suspect that the filmmakers had given up to provide us something that they genuinely believe is worthwhile. The final act felt rushed, silly, and at times laughable with its repetitive gestures of silence. It made me want to scream at the screen–out of frustration, not fear. So far The Cabin in the Woods is the best horror film this year and that wasn’t even scary. 3 out of 4 stars is a pretty good review, but you sound so negative about the film by the end of your review. Not sure whether I will see this. Nice write up! I guess I wanted to emphasize how much I hated the ending. I really did; it was doing so well… and then it turned to… the finale of “American Horror Story.” Or something that felt like it anyway.